meant for note CVs but works for audio too. We use 0.05% resistors in the buffer network to ensure 1:1 gain for precision pitch CV applications. A different configuration based on the same hardware is now available too. A three channel transpose module with one common transpose CV input. This configuration is called the Aroom configuration (after the person who requested it) and marked by filling the circle black on the top of the panel. 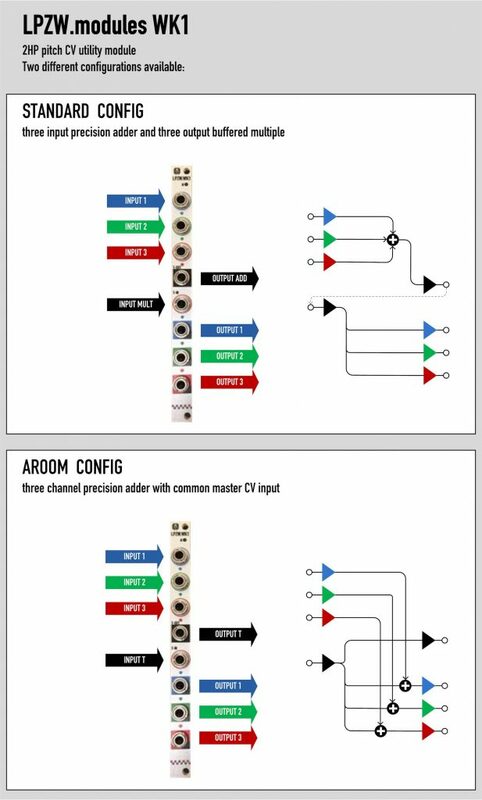 Advanced users can change their WK1 to be either in standard or Aroom config by bridging solder jumpers.